Thanks for sharing your story with us Bruce. So, let’s start at the beginning and we can move on from there. I was previously working as an art director and graphic artist at an ad agency in Boston, but wanted to do my own thing. In 1989, I moved to Los Angeles and started making sculptures and furniture full time. I started off working in wood, but quickly realized that metal would be much better for the kind of things I wanted to make, so I bought a welder and taught myself to use it. Since then I have sold around 4000 pieces over three years, and absolutely love what I do. 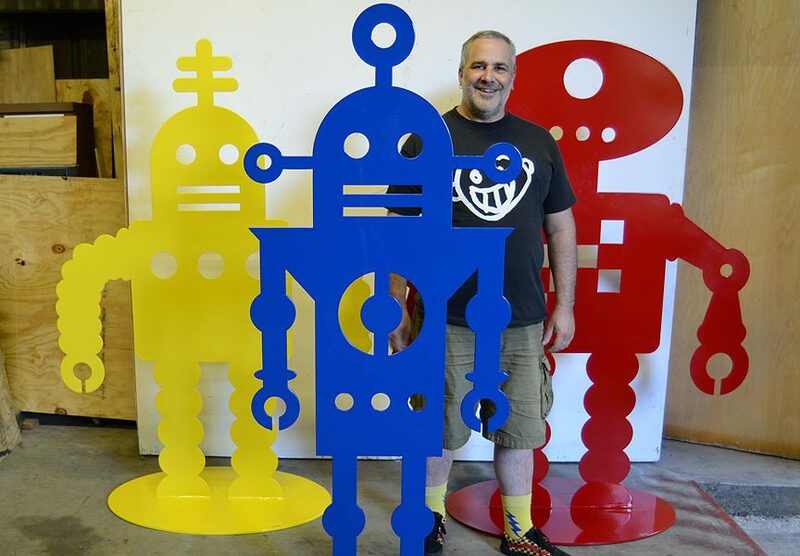 I like to bounce around, doing a wide variety of work including kinetic art, giant objects, abstract paintings, functional art, magnetic sculptures, mobiles, rolling ball machines, found object assemblages, and lots of abstract metal sculptures both freestanding and wall mounted. The income and sales rollercoaster. Things have gotten better, and I recently had my best year ever, with this year possibly even better, but there can still be months of no commissions and then all of a sudden, a dozen commissions all at once, with people hounding me to get them done. Feast or famine has been common, and it seems to be that way for most of the artists I know. So, let’s switch gears a bit and go into the Bruce Gray Sculpture story. Tell us more about the business. I am a one-person business, and have been creating my artworks for over 27 years now. I make a very wide range of sculptural works, and usually work in steel, stainless steel, aluminum, bronze, and wood. I usually just make my own creations, but sometimes I do custom commissions too. My work has also been quite popular with the film and TV industry, and I have had work in well over 100 productions. Lately I have been doing a lot of corporate commissions, which is great because they tend to have a larger budget, and the works get seen by a lot more people. What sets me apart is the fact that there is not much I can’t do, and I have a nonstop brain coming up with new creation ideas every day. I almost never take a day off. I guess I am most proud of the fact that so many of my collectors tell me that owning my work makes them smile every day. I think there has been a switch for many artists to being self representing, rather than relying solely on art galleries. For me I work with art reps, interior designers, galleries, museums, and others, but my primary source of new sales and commissions is because of my website. I see this trend continuing, though we still need galleries because they are the ones that can introduce you to a whole new group of collectors, and they have the ability to legitimize your work and “brand,” and get your prices into a higher bracket.